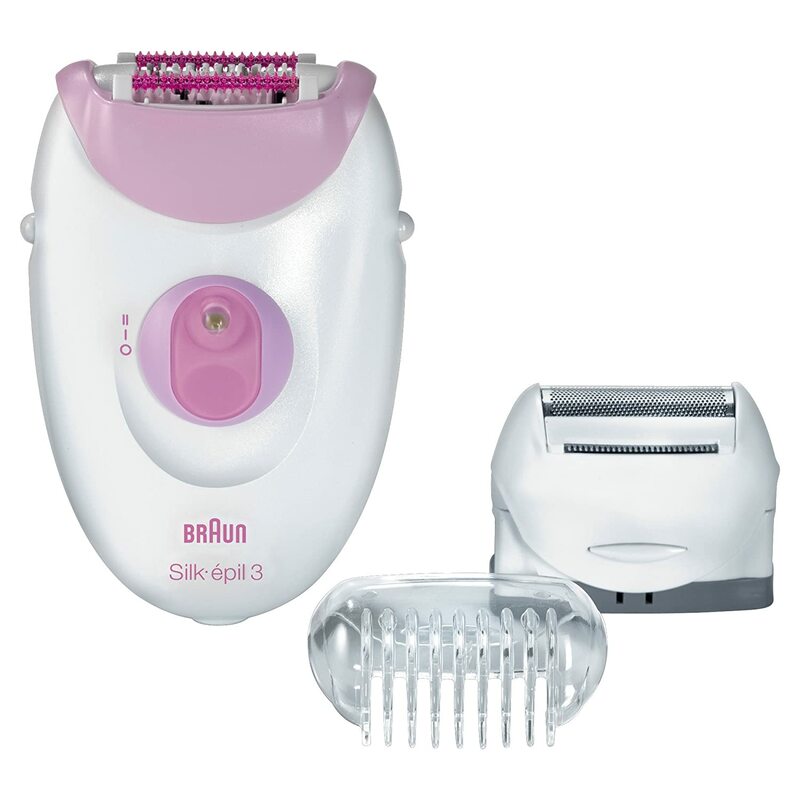 This is a straightforward Braun epilator that has a shaver head and a trimmer cap. It’s comfortable to use and works effectively if you’re not in a rush don’t mind the mains cord. For those who are new to this form of hair removal it’s definitely one to consider and won’t scare you away forever. It’s a great price and doesn’t faff around with tons of unnecessary accessories or crazy designs. For those who are replacing an old epilator or are looking for something that will blow their minds (as much as epilators can) then you might want to look for a better model and invest a bit more to get the most that these tools can offer. Braun have been the go-to company for small personal for almost a hundred years and their vast ranges of products fill the shelves of department stores and pharmacies. A German company, Braun are often at the forefront of technology in this sector and their epilators are some of the best in the market. 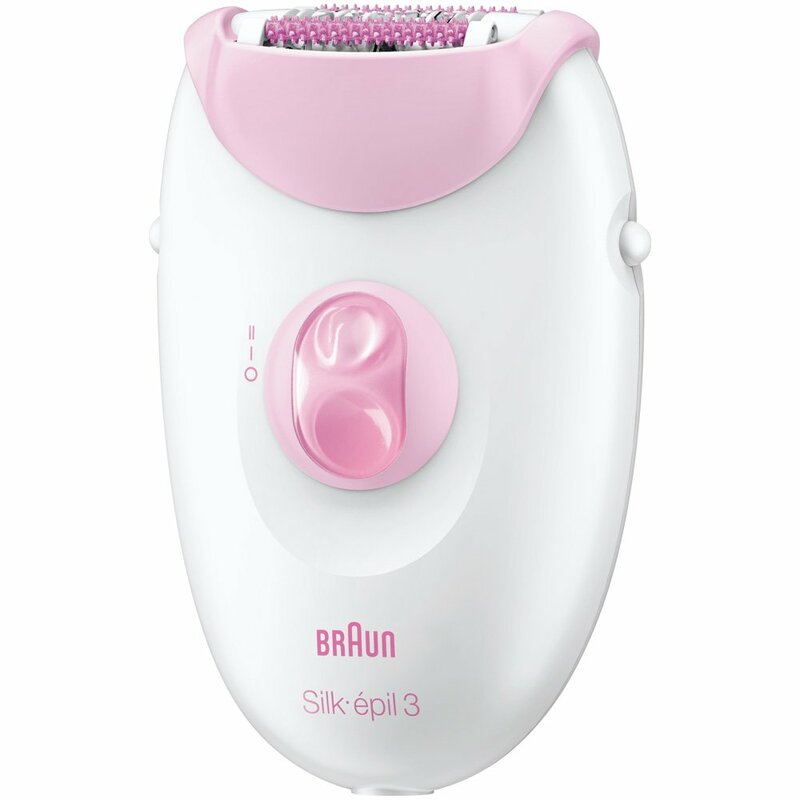 While photographs make it look pretty tiny, this Braun epilator actually fits nicely in the hand and offers good control. It’s baby pink design is feminine without being over-the-top, which is definitely a good thing – no one needs a floral hair removal tool. While some epilators come with more accessories than an outlet of Claire’s, this only has the important ones; a shaver head and a trimmer cap. This makes it a good choice for those looking to buy their first epilator as you don’t want to spend loads if you’re not sure you’ll even get along with it. Regardless of its simple presentation, this Braun Silk-Epil 3 3270 has a fair bit of hidden technology that makes using it a pleasure. The SoftLift Tips are designed to lift up any hair that lies flat and guide it into the jaws of the beast – so-to-speak – and this works well to get all the hairs without having to go over the same area more than two or three times (which can be time consuming). The Smartlight aims to light up the hairs so you know which bits need doing and although I don’t think it’s all that necessary, sometimes it’s quite useful. >>> Click Here to see Pricing and Reviews on Amazon <<< My favourite piece of inbuilt technology is the massaging rollers. They are designed to create micro-pulses that relax the skin and leave the area less painful than otherwise. The success of this is mainly clear when you compare it to an epilator that doesn’t do this – hands down, I’m like the massaging rollers a lot. There are two speed options but which again makes it good for beginners but for those used to epilating and who want to get it done quick, it’s not the most efficient tool out there and even on the higher speed setting you might get bored. It’s a mains only unit and thus has to be used dry and cannot be recharged. I definitely prefer wireless epilators in general and having a cord can be a pain and a tad limiting but for the price? I could let it go. Unfortunately it doesn’t come with a pouch which kind of seems like Braun are skimping a bit here as a storage pouch is easy to provide and very useful. If you’re already an epilating pro then it could be good to look for a product higher up the chain.